Mario Speedwagons is a 4-player minigame found in Mario Party 4. It is also included in the minigame compilation title, Mario Party: The Top 100. Its name is a pun on the name of the American rock band REO Speedwagon. If the player reaches the goal in under 10 seconds, they will unlock Boo's Photostand in the Present Room. This is the only minigame in Mario Party 4 to have no music (other than the "Let the Race Begin" jingle). The camera zooms across the speedwagons each character controls. 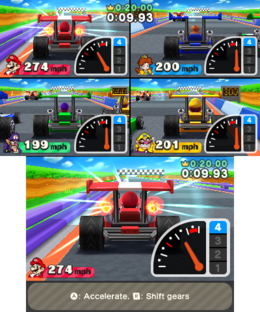 Then, the screen splits four ways, showing the rear of each character's vehicle. The traffic signal flies in and after the "START!" signal (3-2-1 countdown in The Top 100), the signal's lights will turn on. When the green light flashes, the race starts. The goal is to be the first one to cross the finish line in a drag race. 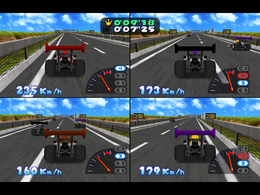 Each participating character drives their own top fuel dragster, complete with unique coloration (player color in The Top 100). Along the way, the car's gears will need to shift as it picks up speed. This is indicated by the gear numbers flashing in the bottom-right corner (touch screen in The Top 100). However, correct timing is required, as shifting too fast or too slow will result in a decrease in speed or no increase in speed, respectively. Likewise, accelerating too quickly at the start can cause the car to not move very much, similar to when in the Mario Kart series, accelerating at the beginning causes the player to burn out and not move much. In Mario Party 4 only, at the "FINISH!" signal, the screen with the winning player zooms in, the player's wagon has a parachute flying off it. After that, the scene changes to the winner podium, where the players are in their respective positions. The winner does their victory pose, and the other players sulk. Rules – "Time to race on the speedway! Step on the gas when the light turns green!" Advice – "You can hit the gas a little before the green light for a good start. If you overdo it, you will spin out and ruin your start." Description – "Shift gears to speed up and reach the goal first!" On-screen – "Shift gears to accelerate and race to the goal!" Zeroyon guranpri "04 Grand Prix"; slang for "400-meters linear race". A minigame with the same name appears in Kirby Air Ride. This page was last edited on April 11, 2019, at 20:20.